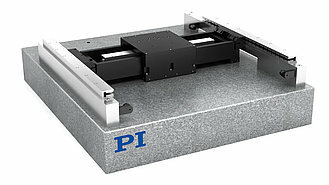 PIglide positioning systems are ideally suited for many high-precision applications such as metrology, photonics, and precision scanning in semiconductor or flat panel display manufacturing. 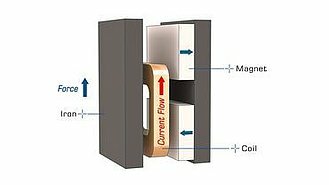 Thanks to the friction-free motion, no particles are formed, which makes PIglide stages ideal for cleanroom applications. (1) Dependent on the flatness of the surface, on which the stage is mounted. (2) Can be limited by the payload, controller or drive. (3) Assumes payload CG is centered no more than 50 mm above the motion platform. The stage is designed for horizontal operation only. (4) Assumes 16384x interpolation. Contact PI for the use of other factors. (5) Improved accuracy can be obtained with controller-based error compensation. The stage must be ordered with a controller from PI to reach these values. Accuracy values assume short-term duration and do not consider the long-term effects of thermal drift on the stage. (6) To protect the stage against damage, it is recommended to connect an air pressure sensor to the Motion-Stop input of the controller.